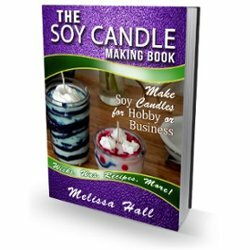 Want some more awesome soy candle recipes and in depth instruction? Soy chunk candles are made by filling a glass container with chunks of colored, scented wax, and then poured over with another color/scent that will allow the colored chunks to show through when it is set. These are beautifull candles that make some neat colors when the chunks melt together with the overpour color, as well as mingling both scents together as it melts. Scale. Digital scales are best for more precise measurement. 8×8 square metal cake pan lined with wax paper all the way up the sides. Four 8oz glass jars. I prefer the square mason jars, but any canning type jar will work fine. Double boiler type setup. You can use a pot with about an inch or so of water in the bottom and a metal bowl sitting on top of it. You can also just get a pour pot specifically for candle making and set it inside a pot that has water in the bottom. NEVER heat wax on the stove without water surrounding, or underneath the container of wax!! 4 wick stickers to secure candle wick to bottom of jars. 4 long clipits, or twixits bag clips (like the ones from Pampered Chef, or IKEA ). These fit very nicely across the top of the jars with the wick clipped into place so it won’t move while the wax cools. Keeps it nice and centered! First thing I do is get all my supplies together in one place. Then go ahead and put water in the bottom of the pot. Set your melting pot that the wax will go into on the scale and 0 it out. Now pour in your wax until you have 1lb of wax on the scale. Set the melting pot into the pot of water (or on top of the pot if you have a double boiler set up). Turn the stove on med low. (If yours goes from 1-10, then set it on about 3 just to make sure it doesn’t get too hot) Use an electric stove, not gas! Then put your candy thermometer in the wax and it would be a good idea to set your timer for about 15min. so you remember to check it. When the wax temp reaches 185-190 degrees, take the melting pot off the stove , set it onto the scale and 0 it out. Then add 1oz (by weight) of blueberry fragrance oil and stir with a rubber spatula ( a good one that can handle the heat!) . 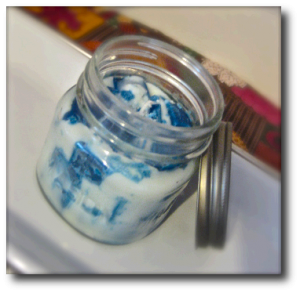 Just give it a few stirs and then add about 7 drops of the blue dye and 2 drops of black dye, and stir until the dye is completely incorporated into the wax. Once the wax in the pan has cooled so that the center is still soft, but not liquid at all, just about the consistancy of butter (Use your finger to gently press to see how soft it is) use your sharp knife to cut lengthwise strips however wide you want your squares to be. I usually make my cuts about 3/4″-1″ apart and then after you’ve cut the wax lengthwise, go ahead and make your cuts across, so it is cut into squares. Now leave the wax to cool completely before breaking them apart. Usually an hour or 2 depending on the room temperature. Set your glass candle containers out, put the wick stickers on the bottom of the metal wick tab and center your wicks in your jars. Push down firmly to be sure the wick sticks nicely. If the wick stickers aren’t wanting to stick to the jar I always just warm the jars up (on lowest oven setting, or stick each jar in the hot water you used for melting the wax, for a few seconds) and then the wick stickers will stick nice and firm. Now that your squares are cooled, you can gently break them apart. Now it’s time to arrange your squares. Just place one row of wax chunks around the edge of the container and continue stacking one row on top of the other until you reach about 3/4″ from the top. (for an 8oz candle by weight, you only fill an 8oz mason jar to about 3/4″ from the top). You can also place your jar on the scale and 0 it out, and then place your chunks in the jar until you have 4oz of wax chunks. Now for the final stage! You can start melting the remaining 1lb of soy wax for the over pour just before you arrange the wax chunks in the jars if you want something to do while you wait for the wax to melt. So just melt your next 1lb of soy wax, just like you did for the chunks the first time. Same temp, measurements and everything. Remember to set your timer so you don’t forget about it! Let the wax cool to the same temp as above..95-100 degrees. Now pour about 4 oz into each jar and clip the bag clips onto the wick so that it is firm and centered sitting across the top of the jars. If you have extra wax shavings or chunks from the soy wax chunks you broke apart, you can sprinkle small pieces onto the tops before they harden for a lovely appearance! Well, that’s it! That is how to make soy chunk candles. I should be adding some pictures soon!